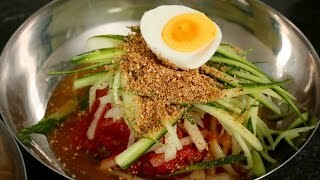 Today I’m going to show you how to make a spicy Korean icy cold noodle dish called bibim-naengmyeon. Unlike mul-naengmyeon (물냉면) it’s not very brothy, but it’s still ice cold and made with a slightly sweet, vinegary, spicy sauce as well as some cucumber and pear. 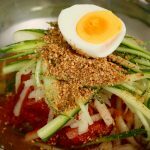 When you eat it, the first thing you need to do is mix it up in the bowl, which is why it’s called bibim, which means “mixed up” in Korean (like bibimbap – mixed rice). 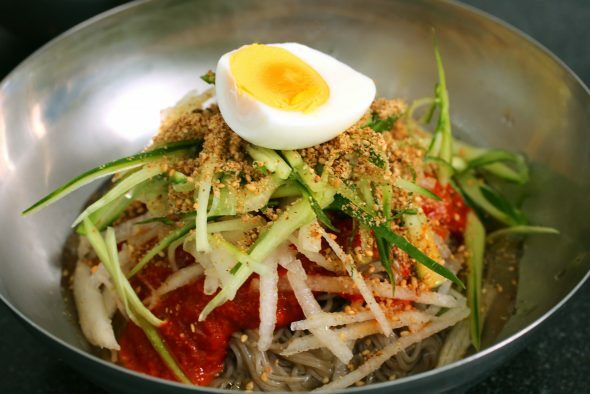 I love all kinds of cold Korean noodles, but bibim-naengmyeon is probably my favorite. I love the cold, chewy noodles and I love the spicy sauce. Many Korean families and restaurants have their own version of this dish and I’ve refined my recipe over the years, making it better and better and always improving it. I hope you enjoy it! 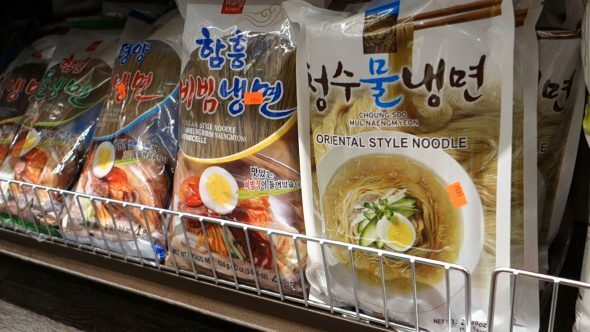 Even though the noodles are pre-made from a package (you can buy them on Amazon if you don’t live near a Korean grocery store), you need to take care to prepare them properly. You really need to scrub and wash them well to remove all the excess starch, so the noodles get nice and chewy. And the final ice bath at the end shouldn’t be skipped! They need to be really icy and chewy, they are not like spaghetti noodles at all. When I was writing my cookbook, my editor was always asking me for descriptive details about what Korean food tastes like. I’ve been eating and making it all my life, so I never thought about describing it! 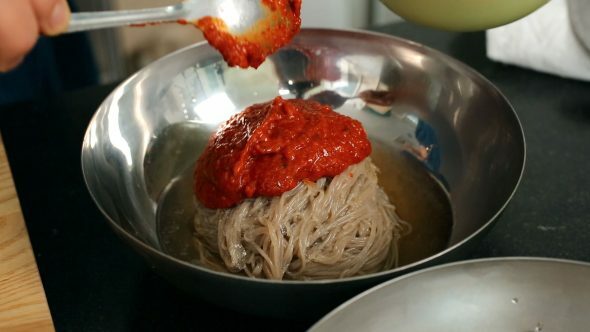 But when my co-writer had naengmyeon she described the texture of the noodles as “a bit like thin red licorice laces.” I never thought of it that way! We put it in the book. Summertime is the perfect weather for these cool noodles, but I actually eat them year ’round! You can vary the amount of sauce used according to your taste, and you can refrigerate any extra for a few weeks, maybe even a month. I hope you enjoy the recipe, let me know if you try it! Mix the broth base with 2 cups of water in a bowl. Freeze for 2 to 3 hours until it turns slushy. If you can’t make the broth in advance, mix the broth base with 1 cup of cold water and 10 to 12 ice cubes and keep it in the freezer while you prepare the rest of the ingredients. Mix 1 cup of cold water with 1 teaspoon sugar in a bowl, to make sugar water. Peel the pear and cut it into halves. Remove the cores. Reserve one half of the pear for the spicy sauce, and cut the other half into thin matchsticks for a garnish. Soak the matchsticks in the sugar water so they won’t go brown. 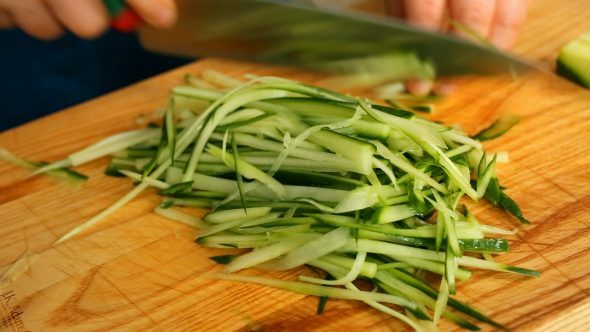 Cut the cucumber into thin matchsticks. Put the half pear, garlic, ginger, onion, green onions, hot pepper flakes, hot pepper paste, soy sauce, salt, sugar, rice syrup, vinegar, and sesame oil in a food processor and grind until creamy. 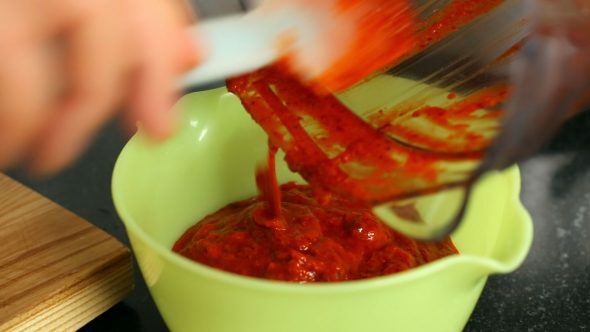 Transfer the sauce to a bowl and refrigerate until ready to use. Bring a large pot of water to a boil. Add the noodles and stir with a wooden spoon. Cover and let them cook for 3 to 5 minutes. Take a sample to taste. When you chew the noodles, there shouldn’t be any hard stuff at all. If there is, cook them 1 minute longer. 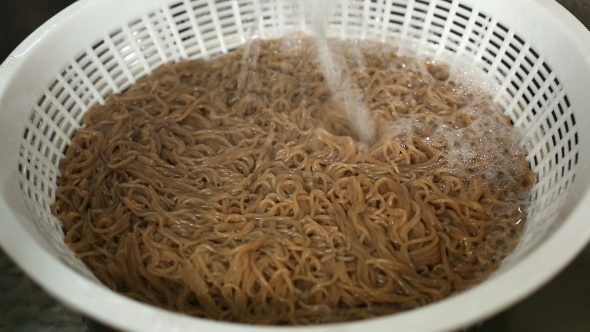 Strain the noodles and rinse in cold running water. Rub the noodles with both hands and scrub them to remove any excess starch. The noodles should get chewy and cold. For your last rinse, fill a large bowl with cold water and some ice cubes. Rinse the noodles well in the icy water. Drain and divide them into 2 large shallow serving bowls. Take the icy broth out of the freezer and pour some into each serving bowl. Put some spicy sauce over the noodles. Place the pear, and cucumber on top of the noodles. Sprinkle a heap of sesame seeds powder over top. Add a half egg to the top of each bowl. Serve right away. Mix it up before you dig in! Posted on Monday, June 2nd, 2008 at 9:40 pm. Last updated on May 24, 2017. Posted January 27th, 2019 at 5:46 pm | Log in to reply. My husky loved it. Joking lol. It was delicious. Thanks. Posted February 27th, 2019 at 8:50 am | Log in to reply. 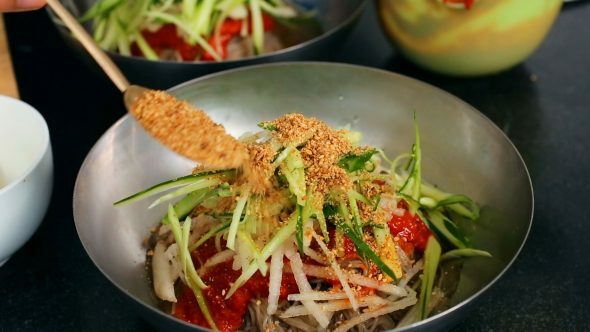 Your bibim-naengmyeon looks so good! 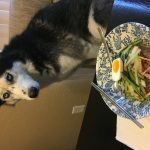 Your husky doesn’t seem to be interested in eating it though! But cute! Posted July 22nd, 2018 at 4:39 pm | Log in to reply. Posted August 2nd, 2018 at 8:51 am | Log in to reply. It looks delicious! 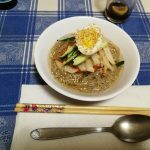 These days I make naengmyeon very often, too! Posted May 27th, 2018 at 12:40 am | Log in to reply. Posted June 2nd, 2018 at 3:22 am | Log in to reply. Wow, it looks so refreshing and delicious! Posted April 19th, 2018 at 4:53 pm | Log in to reply. Wow. I cannot find the right noodles anywhere, except an online oriental market – 1 pack of 750g is £7.55 – ! I may have to save up to fly to Korea and buy some there! That price is outrageous!! But I would love to cook this dish so much – !! Posted April 19th, 2018 at 6:27 pm | Log in to reply. Haioreum Korean Style Premium Cold Noodles. I ordered 2 packs – the cost was quite reasonable…! I will report back on whether they’re the right ones! I hope they are!! Posted May 4th, 2017 at 8:44 am | Log in to reply. I have been on a cold noodle kick lately. I ran out of pear and apples to use so I used Chomoe instead and it came out great. Also I make extra of the sauce to use over meats and other dishes. It is great on everything. Posted April 4th, 2017 at 11:12 am | Log in to reply. Does the spicy sauce have a name? I love making this, I make the cold cucumber soup side dish to go with it. Posted December 18th, 2016 at 10:30 pm | Log in to reply. Posted August 7th, 2016 at 3:57 am | Log in to reply. Looks great. A bit confused as to what “two servings” means but I’ll figure it out. Posted August 10th, 2016 at 12:19 am | Log in to reply. oh, this recipe is for 2 people (2 servings). 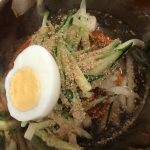 If you make bibim naengmyeon for 4 people, you will have to double the recipe. Good luck! Posted June 23rd, 2015 at 8:19 am | Log in to reply. Hi Maangchi! I made my first bibim-naengmyeon using cubed radish water kimchi, shitake mushroom and soba noodles! It tastes awesome! It is perfect for the all year round hot weather in Singapore! 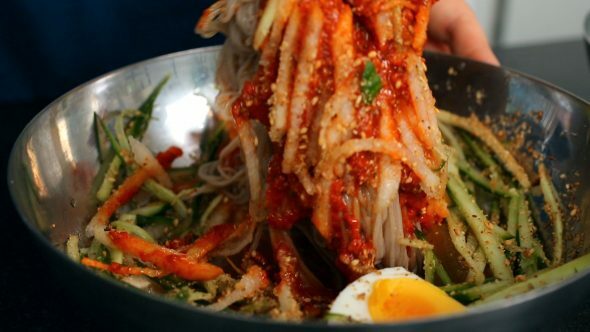 I have uploaded a photo of my bibim-naengmyeon in your food photos. Thanks! Posted January 27th, 2015 at 10:04 pm | Log in to reply. Posted August 10th, 2014 at 11:54 am | Log in to reply. With how hot the temperature here down south , i think i am going to try to make this later . It looks yummy !! Can’t wait ! Posted August 13th, 2014 at 10:47 am | Log in to reply. I saw the photo you uploaded. It looks mouthwatering and very pretty! It will be featured soon. This recipe was originally posted on June 2, 2008 at 9:40 pm by Maangchi. It was last updated on May 24, 2017. The video was watched 870,505 times on YouTube & has 14,955 likes! This video is a remade version of an earlier recipe. The original video was posted on 2008-06-03 and has 599,356 views.